Hi and Happy Friday! Believe it or not I have another finished project to show you! It's my Tapestry quilt from the book Fat Quarter Style. I love how it turned out. Bret and I were cracking ourselves up trying to get a good photo of the whole quilt. We're not the greatest at this but we do have fun! And honestly, would you resist such an opportunity? This comes closer to showing off the whole quilt. 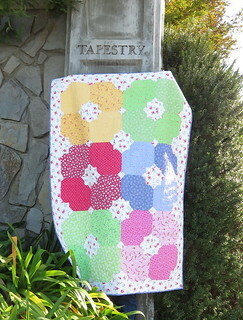 It's made with big big blocks so it goes really fast and the large squares show off the fabrics. I think the quilt would be so dramatic with a dark background as well. Such an adorable quilt! Where did you find the Tapestry signs? Very cool! Just love everything you do! so sweet and bright...I know several little girls in my life that would love that! Very sweet quilt. I love the big blocks too, showcasing the Yummy PKG fabrics. 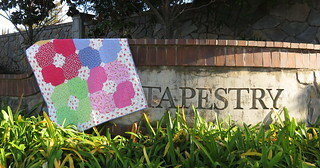 Photographing the quilt outside is a good way to see the true colors. So clever you are, finding Tapestry signs. I think this quilt says little girl love too. That's an adorable quilt just made for a little girl! VERY cute pattern. I just love all the colors in this beautiful quilt. Perfect for this pattern. Where did you find such an opportunity with those matched names? 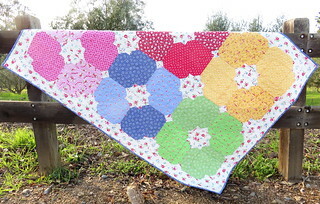 Such a bright and happy quilt! Love it! Your fabrics really make this quilt!! It looks like spring there.. brrr not here. Love everything you do. It is like big puffy flowers. Really love it. It does show off your fabric well. I love your quilt, Pam! And I love the new Pam Kitty Garden fabrics......they are so gorgeous!